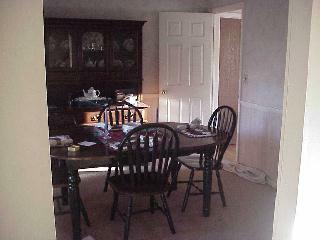 To the left of the front hall is the formal dining room. 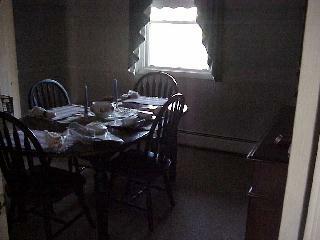 Plenty of room for the china cabinet and the table. 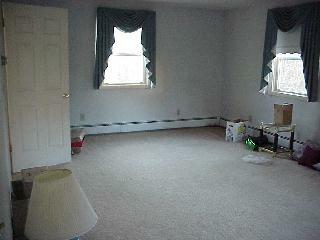 Turn to the right and you'll see the formal living room. This is merely a huge walk-in closet right now, since we don't have a lot of furniture (or any, for that matter) to fill it up. 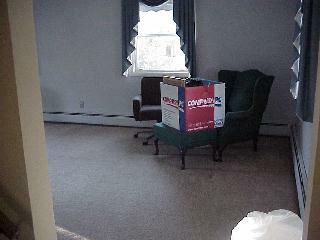 Looking into the living room some more. The door at the end goes to the eat-in part of the kitchen. The wall on the left-hand side is perfect for a piano. 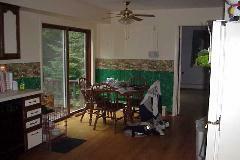 At the end of the front hall is the eat-in kitchen. You see the before and after versions. Before is on the left and after is on the right. The wallpaper was nearly impossible to get off, but we did it. 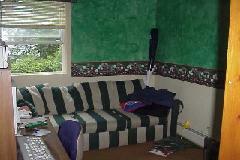 The colors of the wall are dark green (bottom) and ivory (top). The border in the middle is made up of a bunch of fruits and vegetables. Very kitchen-like. 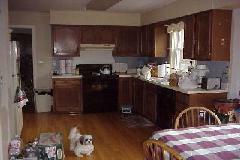 Melissa painted the cabinets - they make the kitchen much brighter and more cheery. The stove you see on the far wall is brand new. The one left by the previous owners was old and not very good-looking. We bought a new one the day we closed. This is the view of the eat-in part of the kitchen. You come into this area from the front hall. It's really cool to have. The old version is on the left, new on the right. 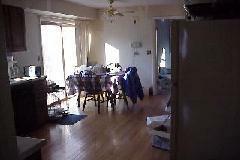 Turn to the right and you'll see the dining room again. 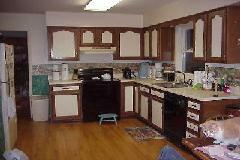 Through the kitchen, you'll go through a small hallway and you can not miss the family room. This is where most of our living will be. 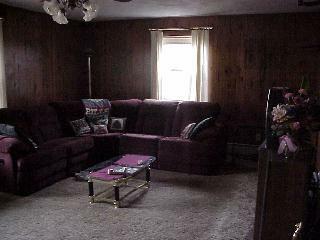 Nice wood paneling and more than enough room for our sectional couch. 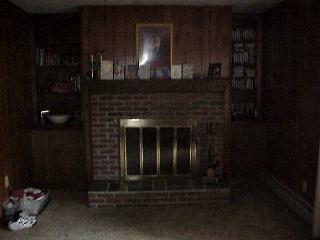 On the other end of the family room is an old, but beautiful fireplace. We now have the traditional mantle for pictures and other little trinkets we have no space for. 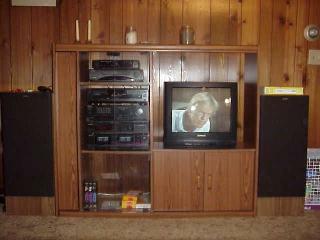 This is a new entertainment center that Roy got rid of when he and his wife moved out of their house. Well, it's new to us, at least. 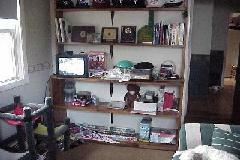 ...and a large bookcase attached to the wall. 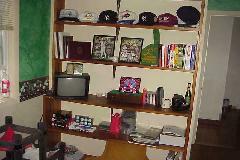 Perfect spot for any computer-geek manuals, sports books, and (of course) the little TV. 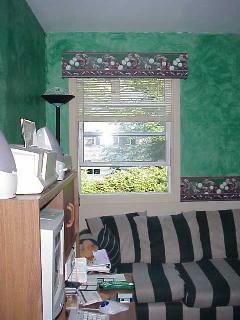 The other major change to the den was the cornice board above the windows. Melissa used the same wallpaper border (the golf-themed one). We think it adds a quaint, homey touch. 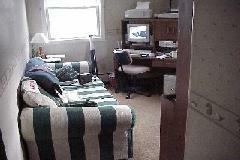 Also notice the different positions of the furniture. Most of the Stans Colonials have room for a closet in the den. 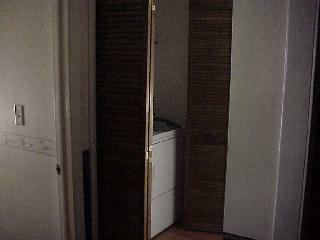 In place of that closet is a laundry facility in the hallway. A lot of the other houses we saw during our search had the washer/dryer in the basement. 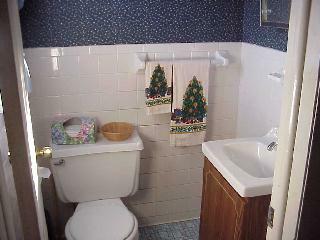 Across the 3-foot hall from the laundry area is a quaint little half bath. Not much to describe here. Let's go to the basement.